Beer Nerd Details: 12.5% ABV on tap. Drank out of a snifter on 11/11/11. It's been a bourbon barrel soaked couple of weeks here at Kaedrin HQ. The above was an unexpected catch at a local beer bar's anniversary celebration, but I've had a few other barrel aged wonders recently, and we're rapidly approaching Dark Wednesday, when Victory will be releasing their Dark Intrigue (basically bourbon barrel aged Storm King stout). They did this last year too, and it sold out rather quickly. Apparently this is the last time they'll be making this, so this is also my last chance to get some. I'm excited. This page contains a single entry by Mark published on November 21, 2011 9:27 PM. Adventures in Brewing - Beer #6: Bottling was the previous entry in this blog. 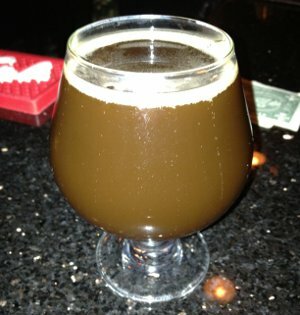 Victory Dark Wednesday is the next entry in this blog.